This item from the upcoming RR Space & Aviation Auction is one of the most interesting lots. What we see is a mission-critical X-ray image of Armstrong’s space suit connections, portion of Armstrong’s A7L space suit torso showing the neck ring and the suit’s PLSS and OPS inlets, taken only nine days before the launch of Apollo 11. 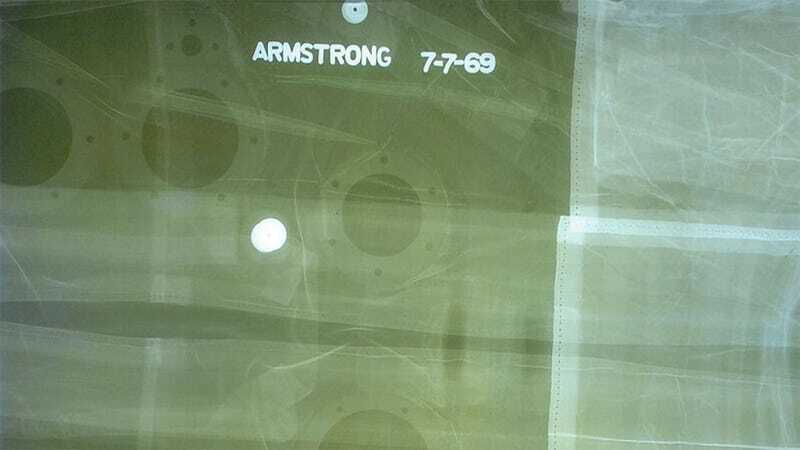 This X-ray was taken at NASA’s Kennedy Space Center as a last minute check to see if any foreign objects were present that could compromise the integrity of Armstrong’s pressure suit, such as broken off needle tips used in the suit fabrication and stitching process. These X-rays were taken and inspected by Jack Weakland, who worked in the NASA X-ray Lab from 1968 to 1979, and who stored them during and after the Apollo program. Sometime later the agency determined they were no longer needed and permitted Weakland to keep them.